What is the easiest way to have my fraud alert victim statement removed from my credit file? Rent Perfect does not have the ability to remove a Fraud Alert Victim Statement for you. You can request to have a Fraud Alert Victim Statement removed by filling out a form and mailing it directly to the credit bureau Experian. You can also submit the form online, however in some cases the credit bureau may still require you to mail in the form. If you originally placed your fraud alert with a different credit bureau other than Experian it may take longer to have the fraud alert removed. To get started, first go to https://www.experian.com/fraud/center.html. Under "Information That You Should Know" click the link that says "Removing a Fraud Alert." Follow the instructions to print and mail in the form or click the link that says "Experian.com/upload" to try and submit the form online. In some cases you will be unable to make the request online and will still be required to mail the form instead. Please make sure you read all messages you get back on the screen clearly and follow all the required steps. Removing a fraud alert can take up to 30 days, however most requests (if completed successfully,) are removed within a week. If you are a tenant who is trying to order credit, once your fraud alert is removed you can sign back into your application and try submitting again for credit. If you still get back an error message for a fraud alert you will need to wait longer and try again. If you are a landlord who is trying to sign in and activate your Connect account you can try again at anytime. IMPORTANT: A Security Freeze is very different than a Fraud Alert Victim Statement. Click here to manage a Security Freeze on Experian's website. Both a Security Freeze and a Fraud Victim Statement will prevent you from ordering a credit report or activating a new Connect account at www.iscscreening.com. These MUST be removed or lifted before you can order credit or activate an account. 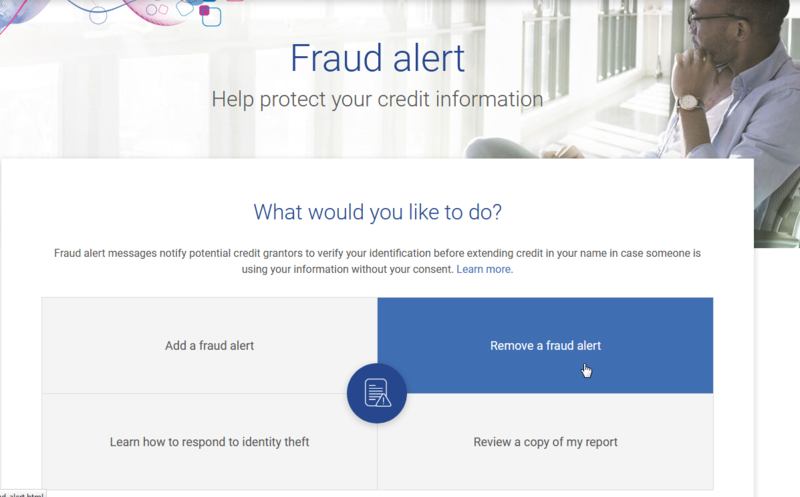 https://www.experian.com/fraud/center.html First click the link "Removing a Fraud Alert." 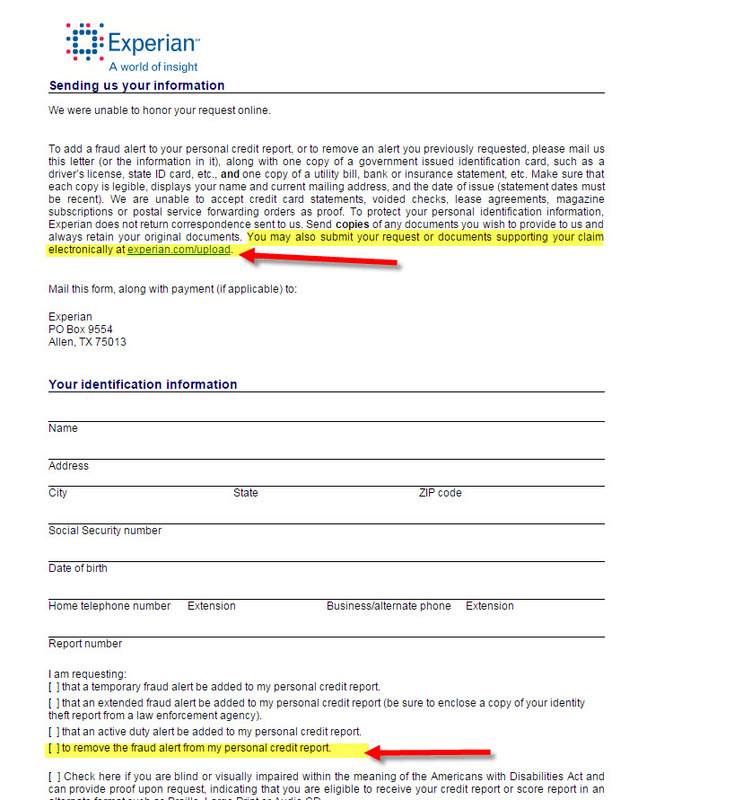 Next, follow the instructions to print and mail in your request or click the link "Experian.com/upload" to try and submit the form online.